Aim: The aim of the present study was to evaluate the associations between infant feeding modalities and metabolic risk factors for urolithiasis in infants. Patients and Methods: A total of 70 infants (<12 months) with urolithiasis were included in the present study. Patients with chronic disease or anatomic abnormalities were excluded. A questionnaire was completed by the mothers. Dietary characteristics (breast and/or formula feeding, plus water supplementation) and family history of urolithiasis were determined. Patients underwent 24-h urine collection via an urethral catheter for analysis of metabolic risk factors for urolithiasis. Results: The mean age at diagnosis of stone disease was 4.47±2.41 months. The major clinical symptoms of the patients were restlesness (45.7%) and vomiting (14.3%); however, 24% of infants were asymptomatic. The majority of patients (64.2%) were solely breastfed and the remaining were given formula to supplement breastfeeding. Twenty-four of the 70 patients were supplied with water. Fifty patients (71.4%) had microlithiasis. At least one metabolic abnormality was found in 90% of the patients. Hypercalciuria and hyperuricosuria were detected in 40% and 47% of the patients, respectively. No effects of water supplementation on urinary metabolite excretion were found. Higher urinary phosphorus and uric acid excretion were detected in patients who were given formula to supplement breastfeeding. Conclusion: Urolithiasis in infancy remains a serious problem in Turkey. Infants with urolithiasis may present with non-specific symptoms. A positive family history of urolithiasis and formula feeding was associated with increased occurence of urolithiasis in infants. In the present study we aimed to investigate the associations between nutritional and metabolic risk factors for urolithiasis in infants. Infants sharing the same environment and with no urological problems were selected so that we could focus on the association between nutritional status and the development of urolithiasis. We prospectively analysed 70 term infants with urolithiasis referred to the Pediatric Nephrology Clinic of Erciyes University Hospital over 12 months. A questionnaire was completed by the mothers. Patients were evaluated for associated symptoms, a dietary history with emphasis on vitamin D supplementation, breast and/or formula feeding plus water supplementation, family history of stone disease, consanguinity, and past medical history. Family history of urolithiasis was accepted as positive when first- or second-degree relatives were found to have a past history of urolithiasis. Associated symptoms were defined as complaints or problems prior to the ultrasonographic examination on which the urolithiasis or microlithiasis were detected. Parents were asked whether their child's urine smelled different from usual (abnormal urine odour) or whether their child had recurrent vomiting or restlessness (different conditions to usual). Patients with chronic disease, anatomical abnormalities, history of hospitalisation during the neonatal period and medication use were excluded. Patients with urinary tract infection were examined following treatment when the urine culture was negative. Inadequate weight gain was defined as gaining weight at a slower rate according to standard growth charts published by the World Health Organisation. Urolithiasis was diagnosed as echogenic foci that caused posterior acoustic shadowing; calculi <3 mm were defined as microlithiasis and those >3 mm as urolithiasis.4 Images of the calculi were verified by two independent radiologists. All 70 infants were hospitalised and underwent 24-h urine collection via a urethral catheter. Urine cultures were sent for bacteriological examination. Urinalysis of all patients was performed and the presence of haematuria, proteinuria, or pyuria was determined by dipstick and microscopic examination. Tests for metabolic risk factors, including hypercalciuria, hyperphosphaturia, hyperoxaluria, hypocitraturia, hyperuricosuria and hypomagnesuria, and an analysis of urinary amino acid profiles were carried out. Parathyroid hormone (PTH), 25-hydroxy vitamin D (25-OH vit D), calcium, magnesium, creatinine, uric acid, and phosphorus levels in the serum were measured in all patients. Patients were divided into groups according to 1) nutritional status; 2) water supplementation; and 3) size of the calculus on USG examination. 1) Nutritional status: Patients who received solely breastfeeding were named the breastfeeding group and patients who received breastfeeding and supplementary formula were named the formula+breastfeeding group. There were no patients who received solely formula. 2) Water supplementation: Patients who were given at least 10 mL/day water free from nutrition were named the water-supplemented group and the remaining were named the non water-supplemented group. Hypercalciuria, hyperphosphaturia, hyperoxaluria, hyperuricosuria, hypocitraturia, and hypomagnesuria were defined as abnormal metabolite excretion. There was no control group in the present study since normal values of urinary metabolites have been previously studied.6-8 Moreover, we avoid the use of urethral catheters in healthy infants. Descriptive statistics and a Chi-squared test were performed using the statistical software package SPSS version 16. The distributions of all parameters were determined using the Shapiro-Wilk test. Comparisons among the groups for the parameters with a normal distribution were carried out using a Student's t-test, and for the parameters with an abnormal distribution, comparisons were carried out using the Mann-Whitney U test. A p-value of <0.05 was accepted as statistically significant. In the present study, the patients consisted of 37 female and 33 male infants (ratio 1.1:1). The mean age at diagnosis was 4.47±2.41 months, with the majority of patients (80%) being diagnosed in the first six months of life. The most remarkable associated symptoms were defined for each patient as shown in Table 1. Irritability/restlessness was found in 32 patients (45.7%), and 17 were asymptomatic (24.3%). Urinalysis revealed haematuria in 12 (17.1%) patients, pyuria in 6 (8.6%), haematuria+pyuria in 6 (8.6%), and normal findings in 46 (65.7%) patients. Urinary tract infection was not present at the time of examination. Failure to thrive or weight loss below the 3rd percentile were not detected in any patients. All blood pressure measurements, renal function tests, and PTH levels were within the normal range. All patients were breastfeeding; 45 (64.3%) were solely breastfeeding and 25 (35.7%) were given formula to supplement breastfeeding. There were no patients who were solely formula fed. Water supplementation was detected in 24 (34.3%) of the 70 patients; 14 of the 45 breastfed patients and 10 of the 25 formula+breastfed infants were supplemented with water. There was no significant difference in the ratio of water supplemented to non-supplemented patients between the breastfeeding and the formula+breastfeeding groups. Microlithiasis (<3 mm) was found in 50 patients, while 20 patients had urolithiasis (>3 mm). The number of patients with microlithiasis was highly independent of the feeding modality. In 32 (45.7%) of the 70 patients, the stones were bilateral; in patients with microlithiasis, 23 of the 50 were bilateral, 5 were on the right side, and 22 were on the left side, and in patients with urolithiasis, 9 of the 20 were bilateral, 3 were on the right side, and 8 were on the left side. A positive family history of urolithiasis was determined in 44 patients (62.9%). The number of patients with microlithiasis was significantly higher in the positive family history group as compared with the negative family history group (Table 2; p=0.01). All patients underwent a metabolic evaluation. At least one abnormal metabolite excretion was detected in 63 (90%) patients. Hyperuricosuria was the most commonly detected abnormality, which was found in 33 (47%) of the 70 patients. Hypercalciuria was found in 28 (40%) of the 70 patients (Figure 1). The levels of urinary excretion of phosphorus and uric acid were significantly higher in patients in the formula+breastfeeding group than in those in the breastfeeding group (Tables 3 and 4). There were no statistically significant differences in the levels of urinary metabolites between the water supplemented and non water-supplemented groups. Similarly, no statistically significant differences were found in the levels of urinary metabolites between the microlithiasis and urolithiasis groups. There was a history of vitamin D administration to all patients. 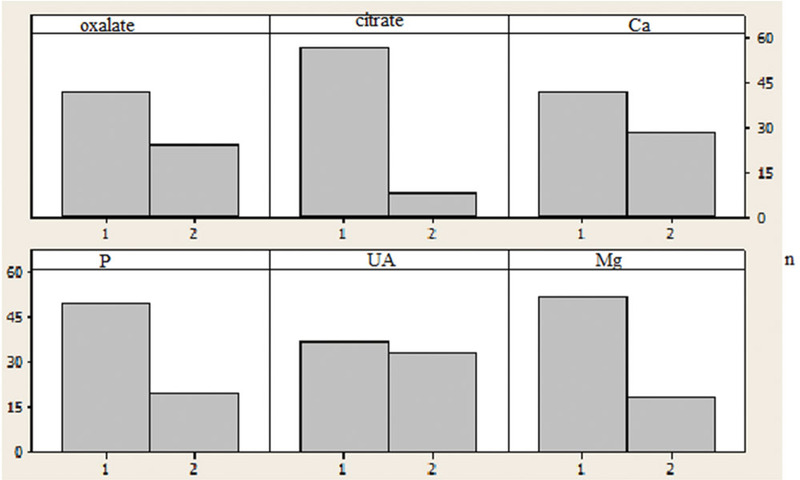 Serum levels of 25-OH vit D, Ca2+, and PTH are shown in Table 5. Hypervitaminosis D was identified in 7 of the 67 patients whose serum levels were measured. A significant correlation was detected between serum levels of 25-OH vit D levels and Ca2+ (correlation coefficient: 0.251; p<0.05; Figure 2); however, no significant correlation was demonstrated between serum levels of 25 OH vit D and urinary levels of Ca2+ (correlation coefficient: -0.1; p>0.05). Urinary Ca2+excretions were similar in both the positive and negative family history groups and in both the microlithiasis and urolithiasis groups. The parameters with normal distribution were expressed as mean ± SD, and the parameters with abnormal distribution were expressed as median (minimum-maximum). Figure 1 Urinary metabolite excretions of patients: 1: normal; 2: abnormal. 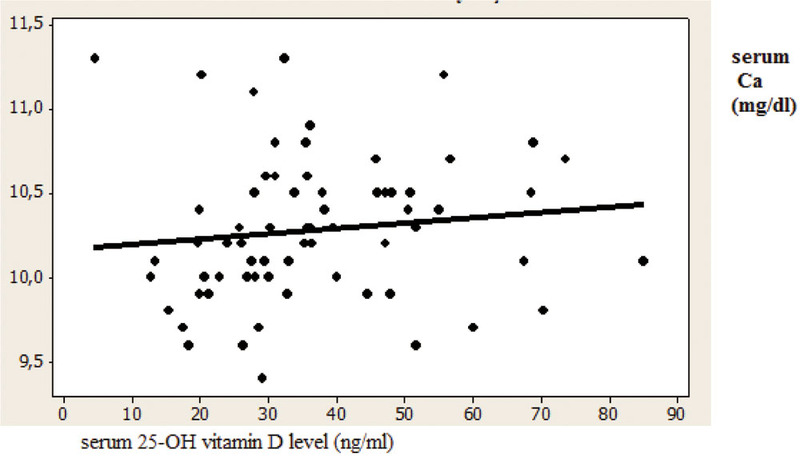 Figure 2 The relationship between serum Ca and 25-OH vit D level. Turkish children have found that urinary stones are the aetiological factor in 3.8% of children with chronic renal failure.11 Recent reports from Turkey regarding childhood urolithiasis have shown that 34-41% of patients are infants,1,3 and in the global literature, 9-23% of reported child patients are infants.12 Infantile urolithiasis should be examined differently due to differences in nutrition, symptoms, aetiologies, and genitourinary tract maturation. Renal calyceal microlithiasis is a renal echographic finding defined as the presence of hyperechogenic spots <3 mm in diameter in the renal calyces. Some studies have revealed that microlithiasis may be the first step in stone formation. Alpay et al,14 reported that 67% of children who had microlithiasis were younger than 12 months old, and similarly, Alamzadeh-Ansari from Iran reported that 69.7% of children with microlithiasis were infants.15 Consistent with the literature, we found that 71.4% of the studied infants had microlithiasis. Urolithiasis in childhood has a different pattern of presentation from that in adults, and symptoms can change with age. Non-specific symptoms such as vomiting and restlessness are frequently reported in infancy.1-3,13 Conversely, in the present study it was shown that 24.3% of patients were asymptomatic and 65.7% had no laboratory clues. These findings suggest that the probability of urolithiasis should be kept in mind and infant patients should undergo renal ultrasonography examination to exclude urolithiasis in endemic regions. Delay in the diagnosis of stones or inadequate treatment may result in damage to the renal parenchyma and renal failure by obstruction. In contrast to that in adults, childhood urolithiasis is more often associated with underlying metabolic abnormalities; ranging from 33% to 93% in different reports. Younger patients are more likely to have an identifiable metabolic risk factors.16 Infant studies in Turkey have reported these factors to range from 46% to 82%.1,2,13 Consistent with the literature, we demonstrate at least one metabolic abnormality in 90% of patients. Hypercalciuria is the most commonly detected metabolic abnormality in both adult and child patients. Hyperuricosuria was the most commonly detected abnormality in the present study, similar to two other reports from the same centre.2,17 As a health policy in Turkey, water is not recommended for infants who are breastfed, since breast milk is considered sufficient to maintain a normal hydration status in the infant. A probable mild dehydration could be the cause of hyperuricosuria. Urinary solute concentrations and urine volume are important parameters in the determination of metabolite excretions. Enviromental factors such as climate or a long summer and urinary tract problems that lead to stasis may affect these parameters. Moreover, hydration and nutrition statuses are listed. In the present study, we aimed to evaluate patients sharing the same environment with no urological or systemic problems to allow focus on the effects of water supplementation and feeding modalities. Increased fluid intake is a mainstay for the prevention of recurrent stone formation, with the aim of avoiding supersaturation through the dilution of urine. A plethora of level 1 evidence indicates that increased water intake can reduce the risk of stone recurrence by up to 50%.18,19 In the present study we found no effect of water supplementation on infants' urinary metabolite excretions. As an important limitation of the present study, we learned water supplementation information retrospectively from mothers, which is based on recall and could be misleading. Elucidation of the effect of feeding modalities was another goal of the present study. Breast milk contains 6.25 mmol/L calcium and 4.52 mmol/L phosphorus,20 and formula contains 11.5 mmol/L calcium and 8.40 mmol/L phosphorus.21 Thus, breast milk is low in phosphorus, and formula is high in both calcium and phosphorus to compensate for the reduced absorption of these minerals by formula feeding. Breast milk also has a lower citrate content than formula. Comparison of urinary metabolite excretions in the present study groups shows that urinary uric acid and phosphorus levels were higher in the formula+breastfeeding group than in the breastfeeding group. As another limitation of the present study, no patients were fed solely formula. Despite the lack of a comparison between solely breastfeeding and solely formula feeding, we demonstrated that certain urinary metabolite excretions were affected by the addition of formula to the diet. An underlying metabolic abnormality was generally found in the majority of cases. We could not show any effect of water supplementation on urinary metabolite excretions; however, due to the demonstrated risk factors associated with formula feeding, we suggest that beneficial effects of water supplementation may be seen at a later date. Certain subpopulations of children are at greater risk of developing stone disease; those with a family history of stone disease or metabolic abnormalities. It must be noted that family history data do not always distinguish between inherited and environmental factors.22 Stechman et al, reviewed the strong heritability of hypercalciuria in twin studies. Genetic predisposition and certain genes determine over 50% of urinary calcium excretion rates. Up to 65% of patients with hypercalciuric nephrolithiasis may have a family history of the disorder.23 Alpay et al, reported that the rate of hypercalciuria is higher in patients with microlithiasis.3 In the present study no difference was detected in urinary calcium levels between patients with a family history and those without. The number of patients with microlithiasis was significantly higher in the positive family history group as compared with the negative family history group, which appears to be a result of early detection in infants with a family history. The present study has an important limitation: there was no control group, since we avoid using urethral catheters in healthy infants; thus, we decided to use literature data as a reference. In conclusion, it is clear that the risk of developing urolithiasis begins in the first year of life. When there is a family history of urolithiasis, any infant presenting with non-specific symptoms may have to undergo urinary ultrasonography examination to exclude urolithiasis. Further studies regarding the relationship between infantile urolithiasis and nutrition/water intake are warranted. Compliance with Ethical Standards: We had approval from our Local Ethics Committee and the study was performed in accordance with the Declaration of Helsinki. Informed consent was given by the parents for all patients prior to inclusion. 1. Güven GA, Koyun M, Baysal YE, et.al. Urolithiasis in the first year of life. Pediatr Nephrol 2010;25:129-34. 2. Baştuğ F, Gündüz Z, Tülpar S, Poyrazoğlu H, Düşünsel R. Urolithiasis in infants: evaluation of risk factors. World J Urol 2013;31:1117-22. 3. Alpay H, Ozen A, Gokce I, Biyikli N. Clinical and metabolic features of urolithiasis and microlithiasis in children. Pediatr Nephrol 2009;24:2203-9. 4. Sivit JC. Urolithiasis. In: Cohen HL, Sivit JC, editors. Fetal and pediatric ultrasound: a casebook approach. McGraw-Hill: USA,2001;370-2. 5. Ross AC, Manson JE, Abrams SA, et al. The 2011 report on dietary reference intakes for calcium and vitamin D from the Institute of Medicine: what clinicians need to know. J Clin Endocrinol Metab 2011;96:53-8. 6. Ghazali S, Barratt TM. Urinary excretion of calcium and magnesium in children. Arch Dis Child 1974;49:97-101. 7. Srivastava T, Alon US. Urolithiasis in adolescent children. Adolesc Med Clin 2005;16:87-109. 8. Milliner DS. Urolithiasis. In: Avner ED, Harman WE, Niaudet P editors. Pediatric nephrology 5th ed. Philadelphia: Lippincott Williams & Wilkins, 2004;1091-112. 9. Bartosh SM. Medical management of pediatric stone disease. Urol Clin North Am 2004;31:575-87. 11. Turkey National Hemodialysis (2004) Transplantation and nephrology registry report of Turkey. tanbul Available at: http://www.nefroloji.org.tr/folders/file/Registry_2003_Tr_Eng.pdf. 12. Milliner DS. Urolithiasis. In: Avner ED, Harmon WE, Niaudet P & Yoshikawa N, editors. Pediatric Nephrology 6th ed. Berlin Heidelberg: Springer-Verlag, 2009;1405-31. 13. Alpay H, Gokçe I, Özen A, Bykl N. Urinary stone disease in the first year of life:is it dangerous? Pediatr Surg Int 2013;29:311-6. 14. Coward RJ, Peters CJ, Duffy PG, et al. Epidemiology of paediatric renal stone disease in the UK. Arch Dis Child 2003;88:962-5. 15. Alamzadeh-Ansari MH, Valavi E, Ahmadzadeh A. Predisposing Factors for Infantile Urinary Calculus in South-West Iran. Iran J kidney Dis 2014;8:53-7. 16. Sas DJ. An update on the changing epidemiology and metabolic risk factors in Pediatric kidney stone disease. Clin J Am Soc Nephrol 2011;6:2062-8. 17. Dursun I, Poyrazoğlu H, Düşünsel R, et al. Pediatric urolithiasis: an 8-year experience of single centre. Int Urol Nephrol 2008;40:3-9. 18. Lotan Y, Daudon M, Bruyere F, et al. Impact of fluid intake in the prevention of urinary system diseases : a brief review. Curr Opin Nephrol Hypertens 2013;22:1-10. 19. Manz F, Wentz A. The importance of Good Hydration for the Prevention of Chronic Diseases. Nutr Rev 2005;63:2-5. 20. Gidrewicz DA, Fenton TR. A systematic review and meta-analysis of the nutrient content of preterm and term breast milk. BMC Pediatrics 2014;14:216. 21. Abrams SA, Griffin IJ, Davila PM. Calcium and zinc absorption from lactose-containing and lactose free infant formulas. Am J Clin Nutr 2002;76:442-6. 22. Sayer JA. The genetics of nephrolithiasis. Nephron Exp Nephrol. 2008;110:e37-43. 23. Stechman MJ, Loh NY, Thakker RV. Genetic causes of hypercalciuric nephrolithiasis. Pediatr Nephrol 2009;24:2321-32.